Located about 40km. away from the capital of the island, Volissos has a long history. On the top of the hill was built a castle in the medieval times The Byzantine castle has a trapezoid shape with six circular towers. Inside the castle there were several buildings, cisterns and churches. there was also a tunnel connecting the castle with the seashore and the Pithonas district. 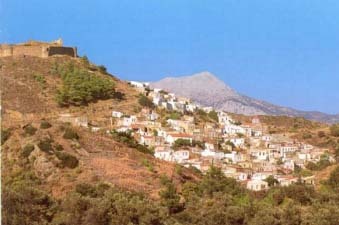 Volissos is the biggest village in NW Chios - Amani mountain area - and it's the capital of Municipality of Amani. Managros, Magemena, Gonia, Limnia (the port which is connected by boat with Psara island), Lefkathia, Limnos, Lampsa, Aghia Marcella, are the beaches of the village dip in the blue Aegean Sea. Wind mills and the ruins of some water mills as well as a lot of Byzantine churches adorn the surrounding area. In the local festivals on August 6th and 15th, the visitor can enjoy the musical and dancing tradition of the villages. In a short way from Volissos there is the pilgrimage of the local Saint "Aghia Marcella". On July 22nd, thousands of worshipers coming from all over the island and the country are gathered to celebrate. Holly water springs from a hole just beside the cold sea.